The Bell Eagle Eye TiltRotor UAV demonstrator was developed to validate and refine basic flying qualities and performance characteristics of a small scale Tiltrotor with the potential for future applications to VTOL UAV missions. Scaled Composites was selected to design and fabricate the composite structure for the two demonstrator airframes, including the landing gear, and to integrate Bell-supplied propulsion and flight control systems. 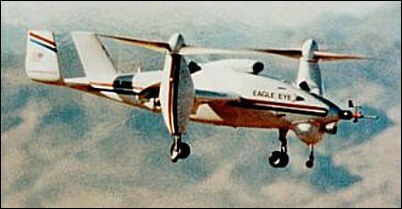 Because of its dual requirements to both hover and to fly as a conventional aircraft, the Eagle Eye required a very complex structural arrangement. Its gas turbine engine (an Allison C20) is mounted in the center fuselage and is attached to a combining transmission. Drive shafts from the combining transmission pass through the center of the wing and connect to transmissions at each wingtip. The wingtips house the transmission as well as the actuator used to tilt the wingtip transmission and rotor assemblies. The cantilever wing box experiences very diverse structural loads during hover and conventional forward flight. An additional challenge was to make the wingbox a fuel tank (wet wing), while preserving the dry integrity of the transmission drive shaft conduits. The composite sandwich fuselage featured three removable sections; the nose, center section and tail. This was done to allow for a reduction in overall length during transport and storage. The nose section was mounted on hinges to allow easy access to the avionics and other mission equipment. The center section incorporated the wingbox, fuel tanks engine and landing gear. Access to the center section is through the removal of the entire top section of the fuselage. The removable tail was attached with a simple lightweight screw row. The tail contains numerous antenna and actuators for the pitch control surfaces. All of the hard points and mounts were installed by Scaled and all the system components including engine, transmissions, oil coolers, avionics, flight control systems, flaps, and control surfaces were mounted and checked for clearance, interference and fit in the fuselage structure before the vehicles were delivered to Bell. Scaled Composites also manufactured and integrated all the landing gear components for both vehicles. The structure was static load tested with the customer's participation (and to their satisfaction). Also included was training to educate Bell's customer (the U.S. Navy) on the composite structures used by Scaled. 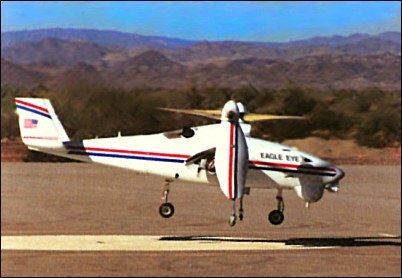 Although the first vehicle was damaged in an accident, the second Eagle Eye demonstrator has been extremely successful, demonstrating all flight phases from hover through the transition, and out to over 165 KCAS in forward flight. This low-cost fast-paced demonstrator program was yet another highly visible demonstration of Scaled's unique capabilities. On November 1,1999, Bell (with teammates Raytheon and Lockheed Martin) submitted an unmanned tiltrotor concept as an entrant in the joint US Navy and Marine Corps Vertical Take Off and Landing Tactical Unmanned Aerial Vehicle (VTUAV) initiative. Bell's VTUAV tiltrotor design is a derivative of their highly successful Eagle Eye demonstrator, designated TR911X. The TR911X demonstrated that it is capable of cruising at speeds of 340km/h and climbing to altitudes of up to 6000m. The existing TR911X design has been upgraded to satisfy all the VTUAV performance specification requirements and half of the objective requirements, as well as to enable future growth. The Eagle Eye demonstrator used 70% off-the-shelf manned-rated helicopter and common hardware parts. It first hovered in early 1992 and conducted extensive tests for the US Navy at Yuma Proving Grounds, Arizona, in late 1993. Bell continued development of the Eagle Eye and early last year was awarded a contract under the Navy's "VTOL UAV Demonstration Program" to demonstrate the performance and maturity of the prototype and its control system. According to the US Navy, the VTUAV system is intended to be a replacement for the Pioneer UAV system "to collect and pass information utilizing an airborne sensor platform that will provide the battlefield commander an extended and enhanced battlespace situational awareness." The VTUAV contract decision for the Engineering and Manufacturing Development (EMD) phase is expected in February 2000.
demonstrate the performance and maturity of the prototype and its control system.